Today let me pull up a really old Dennis the Menace comic, dated June 30, 1964. It’s interesting that since the time of that cartoon, keeping horses barefoot has become an item of interest. Here’s the Wikipedia article: Natural Hoof Care; and here’s an article on Barefoot Hoofcare. And if Dennis is concerned about the poor barefoot horses, what about poor barefoot Joey? Today I’m going with an old (October 11, 1952) Nancy comic. The strip started in the 1930s, drawn by Ernie Bushmiller. It’s probably not worth mentioning that she’s really not barefoot any more with those “sandals” on (and her feet cannot flex properly). However, it is most interesting that, back then, the mother’s concern is not “Don’t go barefoot”; it’s “Keep off the grass”. While barefooters will often tell you that there are no health codes prohibiting bare feet in establishments like restaurants, many who have been around for a while know that there is one area that has them. There’s a cluster of town ordinances in Massachusetts, including Lexington (of Lexington and Concord fame). Birthplace of freedom? Bah! More like the cradle of priggery. And it started a long time ago. 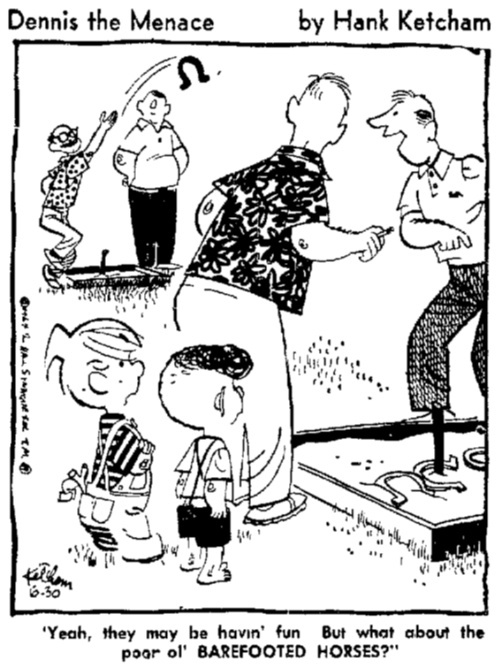 Here’s an Out Our Way (by J. R. Williams) cartoon from August 5, 1964. Most of these strips in the 1960s, as far as I can tell, are repeats from the 1940s or so, so I suspect it’s really from sometime around then. Regardless, it hearkens back to a time when not only did kids normally go barefoot for the summer, they were actively subversive in doing so. Nowadays, so many don’t seem to have a clue in that regard. Here’s a Beetle Bailey comic from November 3, 1969. I have to admit that I find feet to look rather goofy. And if I see somebody else barefoot in a store it looks rather odd. But I think that is really no more than the unfamiliarity of it—it’s just not something that we, even barefooters, see very often. However, that does not mean that I don’t fully appreciate the form and internal structure of the way bare feet work so well in bearing our weight (and how much better feet work barefoot than in footwear).